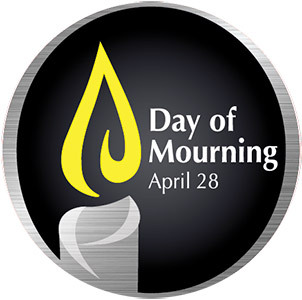 April 28 is the International Day of Mourning, honouring and remembering the people who were injured or died as a result of occupational injury or disease in the previous year. Started in Canada, it is now observed in over 80 countries. In Alberta in 2015 there were 125 lives lost due to workplace injury or illness, roughly one every three days. The official 2015 injury numbers have not yet been compiled, but in a typical year about 27,500 workers per year suffer a lost-time injury (ie. an injury severe enough to require the worker to miss at least one full day), about 43,100 workers per year undergo a modified work claim (the worker’s duties must be changed temporarily to accommodate working while recovering from injury), and about 54,300 workers per year suffer a disabling injury. Added together, that means that roughly one worker in 20 in Alberta will suffer a serious injury this year. This is an enormous human cost. It affects the co-workers, family, and friends of injured people, changing their lives in the short and long term as they deal with the injured worker’s inability to do all things s/he used to be able to do. Or worse, dealing with the permanent loss of that individual, looking for answers and closure, and trying to live with that hole in their own lives. And then there’s the societal impact. With more than 100,000 serious workplace injuries every year in Alberta, additional pressure is put on our health care system dealing with the immediate injury and subsequent rehabilitation. Houses have to be renovated at huge cost to accommodate people who lose the use of their legs. Workers who miss time due to injury are compensated by WCB, which costs Alberta companies more than a billion dollars every year in premiums. In my line of work I’ve seen many serious injuries, from lacerations to partial amputations, to crushed fingers to broken bones to burns. I’ve seen first-hand what damage injuries in the workplace can do and the harm they do not only to the injured workers but to the people around them. Some people never recover from the physical injuries; even more never really recover from the psychological damage. I remain in this business because I’m committed to helping reduce the severity of injuries or prevent them entirely so fewer people have to deal with this trauma. On April 28, please be sure to take a moment to think about all the people whose lives have been affected or stolen from them by workplace incidents. This entry was posted in Health, Occupational Health and Safety, Safety on April 26, 2016 by Jim Flannery.